Brook trout photo © Brian Jorg / CritterZone: Animal - Wildlife - Nature Stock Photography (all rights reserved; used by permission). The only trout species that is native to Pennsylvania, brook trout live under water conditions that are cool, clean and pure. 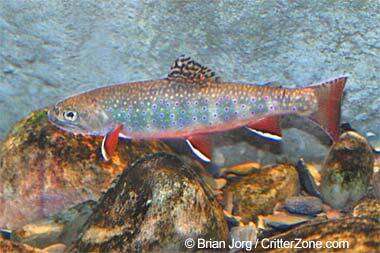 Brook trout (public domain photo by Eric Engbretson / US Fish & Wildlife Service. Brook Trout Spawning-underwater footage-spectacular - Wild Visions, Inc.
Video of Brook Trout Spawning-underwater footage-spectacular - Wild Visions, Inc.